Welcome to the UTARC website hosted by UT! The experimental station 5XU was established on the University of Texas campus on October 1, 1921. Since then, our main goal is further the enjoyment of Amateur Radio (or Ham Radio) by providing aid in obtaining a Ham Radio license, by providing a working HF and VHF radio station and through contact with other operators and radio enthusiasts. 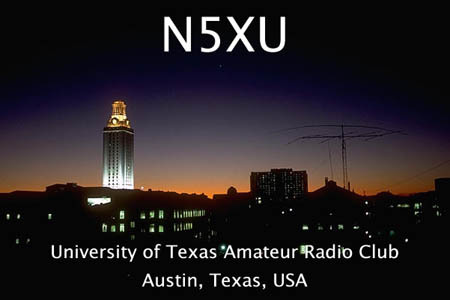 We participate in Ham Radio activities at national and international level and interact with clubs and other organizations in the Austin area. Everyone affiliated to UT is welcome to join us at our meetings, and we will be happy to add you as a member to the club. We don’t charge any dues or fees, so anyone can enjoy the broad spectrum of Ham radio activities for free with us!